It is the prettiest trek in India. 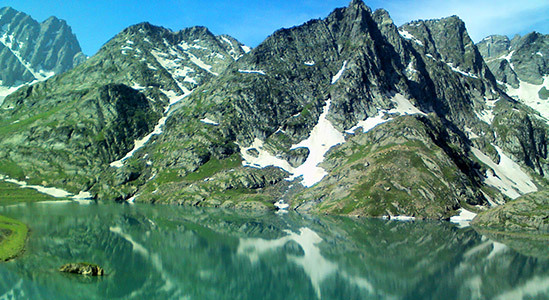 It has five beautiful alpine lakes. It offers lifetime experience of vintage memories. It is describe as hidden jewels of Kashmir. You will also pass through many small bridges and ramble. You might also milky white icebergs floating on the lake. In the lap of Himalayas nestled the Kashmir valley the dream land, and the pride of India, well known for trekking, as trekking in India is wonderful, and since long people are visiting it, here the Kashmir valley offers the blend of mesmerizing beauty, and the enthusiasm in each step. The trek to Kashmir great lakes trek offers a beauty that is like a dream, the attribute that the lakes carry is the silence thunder in them. Kashmir great lakes altitude is 13,750 Ft. encompasses by the Himalayan range, the snow clad mountains, the massive landscape stands with pride in the whole Kashmir great lakes trek. As Kashmir is the paradise on earth so it has no doubt that you will have an ultimate experience on the Kashmir great lakes trek that will for sure be unforgettable. Himalayan range that is nestled in India, offers the most astonishing view when it’s about trekking in India, Kashmir great lakes trek demands a decent physical fitness, as it is graded to be moderate therefore a trekker have to maintain a good care of their body. The trek is of 8 days, starts from Sonamarg and ends on Naranag after that the drive to Srinagar from where you head towards your home. The whole Kashmir great lakes package is worth choosing of INR 11,999/- only, the trek of Kashmir Great lakes will offer you a perfect savor in the green soothing lands, snow clad glaciers, and mountains crest will be so beautiful that they won’t let you distract your mind from the beauty of it. The trek is favorable for children’s age above 15, as the difficulty level is higher than average. Somehow, this Himalayan trek is graded as the moderate trek so it is depend upon the person and the fitness of the individual through can be recommend to the first timers having a fit body. The Kashmir Great Lakes Trek has tricky patches, but a well-planned itinerary of the Kashmir great lakes trek will make it less tiring for the trekkers. The altitude of Kashmir Great Lakes Trek is 13,750 Ft. one can attain the maximum altitude depends on the subject to his endurance, and other conditions such as a climate, temperature, The trek will open up the Great Lakes and on the higher altitude, everything will look so mesmerizing. The things that one has to keep in mind is to take a proper medication with them at the higher altitude, though we provide every possible thing but it is always better to keep your medicines according to your health, Hydration is the most important when you will trek to the higher altitude, so keep your body hydrated while trekking. The best season for Kashmir Great Lakes trek is in July and August; a trek to this admirable destination can be planned between these months as the destination glows the most, whereas in winters this resplendent destination is always wrapped into the blanket of snow even in these months one can behold the snow in abundance. The Destination offers the splendid view; the landscape is beyond imagination, the gigantic mountains wrapped with snow looks mesmerizing. Enriched by the glory of nature Trekking in Kashmir can be the best experience in both the season, where this trekking to Kashmir Great Lakes is no doubt a delightful one. During the daytime temperatures will range from 17-20 0Celsius which drops to 3-50 Celsius in the night. One should bring enough pair of clothes and a better quality trekking boots so that a trekker can be covered thoroughly and does not face any difficulty during the stay at this temperature. There is a vast difference in the mountain temperature, and when it about the trek to Kashmir Great Lakes, so it might be possible that one can encounter a little difficulty during acclimatization. 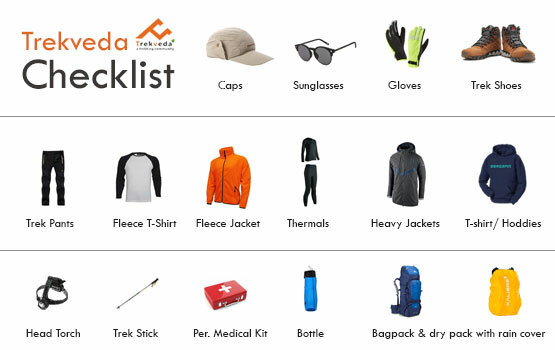 It is essential to bring all warm clothes, and that may not even affect the backpack too much. Kashmir Great Lake Trek is settled at an elevation of 13,750 Ft. Kashmir great lakes is the most fantastic trek that offers the unusual mix of breathtaking adventure and fun, the entire voyage of Great Lakes is not just about the beauty but it is the paradise itself, it makes one forget all the outer world and make one to get lost into the nature. Kashmir Great Lakes Trek is a sublime trek among others when it's tied in with trekking in Kashmir, as Kashmir is the paradise of earth it has everything the beauty that is beyond one’s imagination, and there is no uncertainty that the destination is thoroughly entrancing, the Himalayas are the shelter for India, like this trekking in India in the most popular. The most exotic trek that opens up the perspective of lush green meadows, capped mountains, and adventure of all time, Where the Kashmir great lakes trek takes you through the massive mountains and the breathtaking view all through the way it won't keep you quiet by any stretch of the imagination; instead every vista towards Kashmir great lakes will energize you to achieve it as soon as possible. The wellsprings that stream downwards and converge with streams all through the way and the snow applauded mountains, alongside the scene in the entire voyage will be treated the eyes of each trekker with the natural gifts. The journey of Kashmir great lakes trek will start from Sonamarg, you can spend time in Srinagar prior driving to Sonamarg, (drive will not be provided by us). Srinagar the dream land, the beauty of which is totally magical, and one can witness the Lakes, gardens, and the soothing greens that will make your mind feel free, and refresh. Kashmir great lakes along with this beauty Srinagar are the mesmerizing blend of Kashmir valley, the drive from Srinagar to Sonamarg will take almost 3 hrs to reach there. The journey towards Sonamarg will be so magnificent that it will give you the idea how admirable your journey will be to the Kashmir great Lakes. Kashmir great Lakes trek is one of the most astonishing trek among other treks in India, in this busy life if you’re able to get you escape in the Kashmir Valley then it is the most wonderful thing till now. Altitude: 7,800 Ft. to 11,500 Ft.
Water sources: Bring at least 2 liter though you will get the source. The 2nd day will be a trekking day in your journey of Kashmir great Lakes; the trek will take head towards Nichnai that will take 3 hrs ascent followed by 1 hrs descent and finally a normal ascent towards Nichnai. The trek will start 3 Km away from the Sonamarg, and later on when you will spot the Lone Dhaba, the place from where you can collect the useful things for your day such as packaged water, and some food items to stay healthy throughout the trek. Keep that in mind this would be the last place from where you can by the eatables, futhure nothing will be found. When you will start your trek for the most beautiful place Kashmir great Lakes, the trail will be so magnificent into the Kashmir valley, the blend of green meadows, and the blue pleasing sky will treat your eyes. Later on, after half an hour you will reach the top of the green meadows that you will cross initially. Where the tree line of Maple and Pine starts, and the trek will start a little descent, and then again it will ascent. Trekking in India and Kashmir trekking is famous where walking on the green bed of grass amidst is so unique, passing through the maple forests, ridges, the green meadows, and the little streams that will look so mesmerizing and will keep you engaging in the beauty of the Nichnai. Kashmir great lakes cost you nothing but a time from your busy life to explore the beauty profoundly, after sometime trekking from Nichnai you will reach Shekdur where you will camp for the 2nd day that is surrounded by the Bhoj trees. Altitude: 11,500 Ft. to 12,000 Ft. via 13100 Ft.
On the 3rd day of trekking, there will be a long walk into the Mother Nature; the green meadows with the changing beauty in each step will be so wonderful. The day will start early after breakfast so that you will get more time to taste the beauty of green meadows, and so you can stroll up in the meadows. On 3rd day first you will pass the Nichnai Pass that will be easily visible from your campsite, when you will start passing the Nichnai pass you will witness the exotic beauty the crystal clear rivers, green soothing meadows to stroll around. Another place that you will pass by is Vishansar Berry, and from Nichnai pass you will be able to behold the beauty of Sonamarg valley that will look so mesmerizing in the lap of Himalayas. There will be a medium climb to Nichnai Pass and small descent that will be followed by the long flat meadows walk that will wind near Vishnusar Lake. Reaching the lake you will be able to behold the beauty of the wonderful lake that will be the first step of the amazing journey towards Kashmir great lakes. 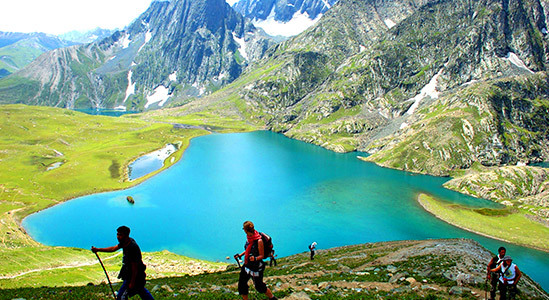 You will be able to witness the flowery meadows, waterfalls, and the Vishansar Lake that is encompasses by all greens, the Kashmir great lakes trek is wonderful trekking spot when it’s about trekking in Kashmir . Throughout the way you will be able to witness many crests of Himalayas resting peaceful with pride, and those snow-capped peaks will give you the glimpse of how trekking in India and trekking in Himalayas can make you feel excited. Exploring the Vishnusar will be so mesmerizing that can blow you mind, the beauty that it carries is ultimate, the nature on these destinations shows it well that Kashmir valley is the dreamland for the trekking lovers, and The Kashmir great lakes trek is the wonderful experience itself. 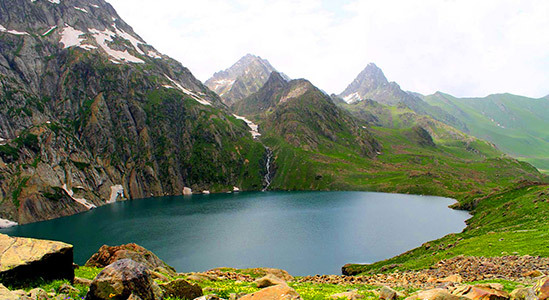 Later on moving to Kishansar twin lakes that offer the ultimate vista of all time in the Kashmir great lakes. It will also be an acclimatization day where you will be able to get familiar with the climate of the Kashmir valley, and that would be helpful later as you will move forward in the trek. The trek is most astonishing and the whole Kashmir great lakes package can be a worth choosing at least once. 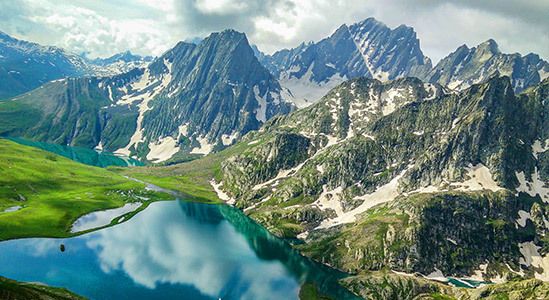 Altitude: 12,000 Ft. to 12,000 Ft. via 13,750 Ft.
On 5th day in your Kashmir great Lakes trek will be the another lake you will explore and that will be the Kishansar lake, lies about Half Km away from the Vishnusar, the lake lies at the base of the Kishansar peak. It will take around 50 min to reach the Kishansar Lake though depends on the trekkers capability, along with that moving right towards the river streams and in your right the Vishnusar Lake will give you the astonishing vista, you can take pictures of the ultimate destination. The whole trek will be steep descent later followed a normal walk in the meadows, Kishansar is huge, and it has the beauty outstanding, later on the trek will be head towards Gadsar pass. Reaching Gadsar pass with the initial descent, and the descent will be straightforward, the first lake will be visible that will be Yamsar lake. On the way of Gadsar that is the prettiest lake on this trek, basically Gadsar is at the base of snow clad cliffs, later on your journey you will witness the gentle slope down. 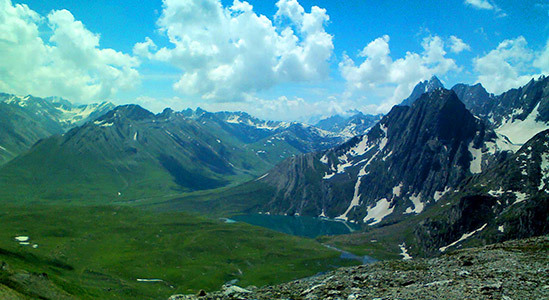 The Yamsir and the Gadsar are connected by a stream as water flows; Gadsar is nestled at an altitude of 12,500 Ft.
All the Kashmir great lakes are so astonishing gives you the magical glimpse of the Mother Nature, Kashmir valley is the most wonderful and trekking in Kashmir make a person living the best days. Gadsar Pass is the magnificent place, the soothing green; the uneven ground the soft lush green color will be celebrating the beauty, and the destination encompasses with the whole Himalayas range will be so picturesque. Altitude: 12,000 Ft. to 12,000 Ft.
On 6th day from the camp of Gadsar you will move towards Satsar that is a normal descent for 1 hrs that is followed by a steep ascent for 3 hrs later a plain meadows walk will be followed. This day the trail will pass by the streams and mountains that will look magnificent, the Satsar camp will be at 12,000 Ft. the magnificent view that is encompassed by the mountains and in between the green meadows will make you get lost into the nature, the ridges that will be so adventurous along with that fun will make you have more fun. After you will cross the stream, and take yourself towards the mountains, the trail will little difficult so keep in mind that you have to take a clear steps. Later on, the tree line will be over as you will reach above it, the trail will take you through the mountains where you will be able to witness the Maengandob besides you and the place will be so spine-tingling. The whole landscape in this destination will be so captivating, and no cannot deny the fact that trekking in Kashmir is nothing less than a dream comes true moment. Later on, after trekking for a long time you will be able to witness the Satsar Lake, the Satsar Lake is the amalgamation of the 7 lakes, and among seven you will be able to find those lakes with water though which is totally depend upon the season you are choosing to trek. You will be able to behold the beauty of Kashmir valley, and the essence of Trekking in India where this Kashmir great lakes trek is ultimate. Altitude: 12,000 Ft. to 11,500 Ft. 13000 Ft.
On 7th day of the Kashmir great lake trek you will be head towards Gangabal twin lakes from Satsar that will be a easy ascent followed by gradual descent later followed by long steep ascent and long steep descent followed by up and down strolling. The trek will start, and you will cross by each Satsar lake one by one, and later reach the last and the biggest one lake from where the path will become difficult such as full of boulders, and rough patches. After the last lake trek will start to descent, on the way you will witness the forests line in your left, and the ridgeline on your right then again you will ascent, that will be little hard. Keep that in mind that you have to listen the trek guide carefully, as Kashmir great lakes is moderate trek so it will be hard to walk a bit; still trekking in India is itself an adventure for the people. Later on, the trek will lead a zigzag path, almost 45 min of trekking will lead you to reach the top of the ridge line, once you will reach the top, you will witness the two more massive ridges to climb. Once on the top then you will be able to behold the beauty of gujjar huts amidst the tall pines, and you will see the bareness of the mountains and the greenery other side. After a long trek, you will reach the Nundkol from where Gangabal twin lakes, the streams of Gangabal has a cross that lead it towards Nandkol, but you not cross it suddenly as it will be risky so always ask you trek guide before taking any strange step. Altitude: 11,500 Ft. to 7,450 Ft.
8th day you will drive back to your way but pass by Naranag that will be a difficult one, make you to take easy step correctly else it could be hard to reach back home. This day it will be tiring, and the path will be tricky and rough path, there will be a gradual descent that will be followed by steep descent. The walk will be on ridges that will end later on and open up the descent into the green flat meadows, where you will be able to witness the Harmukh peak that will look so impressive when you look back. Later the pine trees line will be seen and you will also be able to see the traces of humanity as the area of civilization will start from there, the decent from there will be steep, and the trail will be muddy through the thick of the pines. There you will reach Naranag, Naranag is the beautiful sight but it would be little tricky, and rough therefore it could be a test for you, later on you will drive to Srinagar and the trek of Kashmir Great Lakes trek will be over, This trekking in Kashmir would be the most wonderful destination in your journey. The trek expense of Rs. 11,999 + 5% GST takes care of all expenses of the trek from Sonamarg to Srinagar. Backpack offloading charges - If you wish to offload your backpack, there will be an additional charge of Rs. 4,900 + 5% GST. The backpack cannot weigh more than 9 kgs. Suitcases/strollers/duffel bags will not be allowed. Please note that charges will vary for last minute offloading in case you decide to offload your bag after reaching the basecamp (Rs. 5,250 + 5% GST). Online offloading in advance is possible up to two days prior to the trek start date. Buffer day – It is mandatory to have this extra day as any bad weather or rain will delay your pass crossing. If buffer day is utilized, you will need to pay Rs. 1,720 + 5% GST. This amount is to be handed over to your trek leader.